There are five different classes of antibodies. Antigen binding is an immune process where an antibody binds to an antigen. 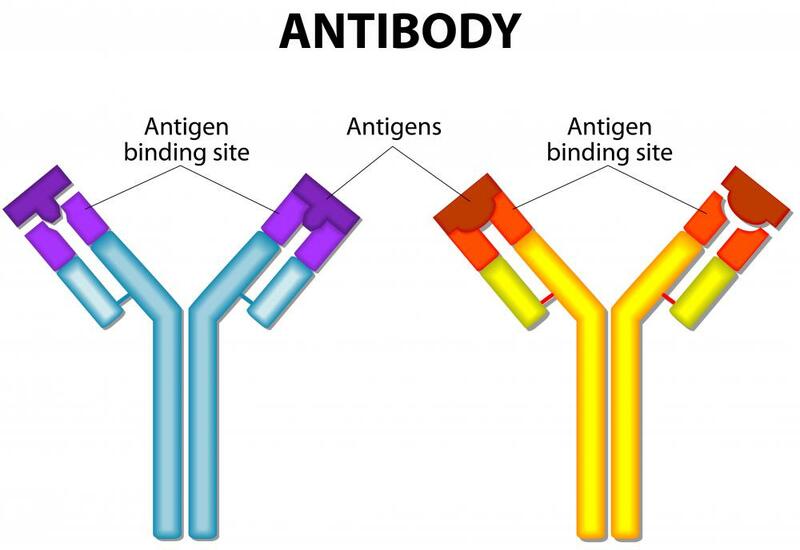 Antibody binding happens during an immune response between antibodies and specific antigens. Antigens are any cells or molecules that are recognized by the body as foreign, or not belonging to the self. Antigens can take many different forms from disease-causing organisms, like bacteria and viruses, to toxic molecules or allergy producing molecules, allergens. The presence of antigens within the body stimulates the cells of the immune system, including those that produce and secrete antibodies. Antibodies are proteins that have a distinctive basic structure. They are made up of four polypeptide chains that are held together by disulphide bridges, which are bonds that form between sulfur atoms. Each antibody has two long, or heavy, chains and two short, or light, chains. Each light chain is found at the end of one of the heavy chains. The four chains are held together in a Y shape, which allows flexibility so antibody binding can occur. Each antibody is specific to a particular antigen. The specificity of the antibody is determined by the antigen binding site found at the end of each light chain. The sequence of amino acids found at the end of each light chain forms a three-dimensional shape that is complementary to the shape of the antigen. As there are two light chains for each antibody, there are two antigen binding sites, so each antibody can bind to two antigens. There are five different classes of antibodies. 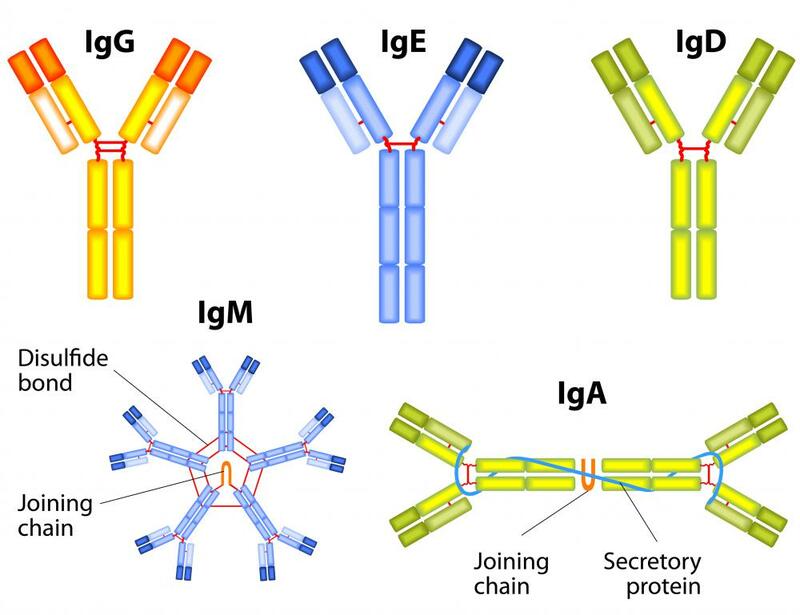 As they are all globular proteins produced as part of the immune response, they are called immunoglobulins, with each class designated by a letter, G, M, A, D and E. While all immunoglobulins share the same basic structure, the different classes are based on differences in the heavy chains. There are can be many different antibodies within each class with specific antibody binding occurring between the specific molecule and its complementary antigen. Each of the different classes of antibodies binds to different types of antigens and has different roles in the immune system. For example, immunoglobulin G, IgG, can bind to two antigens, stimulates other cells in the immune system and can cause agglutination. Agglutination occurs when antibody binding occurs between multiple antibodies and antigens. This can happen when an antigen also has more than one binding site, which allows it to bind to more than one antibody. As more and more antibodies and antigens bind together, they form a clump, or agglutinate, which aids in the destroying of the cells with the antigens. What Is the Immunoglobulin Heavy Chain? What Triggers an Antibody Response? What is the Basic Antibody Structure? What is a Binding Antibody? What can I Expect During a Parvovirus B19 IgG Test? @MrMoody - This article was eye opening. I went to the doctor once to get a refill on some medication I had been taking. He said that despite taking the recommended dosages as he had prescribed, the levels of the medication in my bloodstream seemed low. He mentioned something to the effect of “protein binding” as being the culprit. I didn’t really know what he meant at the time, but he boosted my medication just a little. All I know is that I had recently changed medication, and my body was getting used to the new medicine. After reading this article, I have a theory. body, and the antibodies went on the offensive against it, thus diminishing its effectiveness just a little. Either that, or the medication was binding against the disease causing germs. I think that one of those theories is correct. That’s my non expert opinion, of course, but it seems to make sense in light of how the article defines antibody binding. @MrMoody - Well, I think the antibodies are produced by the white blood cells too, so you were pretty close in your understanding. I’ve heard of illnesses that result from having a low white blood cell count. If your white blood cells are low, you don’t have the defenses that you normally have, and therefore germs, bacteria and stuff like that become an imminent threat. I don’t know what normally triggers a situation where there is a low white blood cell count, but I have heard that some chemotherapy treatments for cancer patients will bring the condition on. It’s fascinating to read how antibodies go on the attack against antigens as part of the work of our immune system. I can just visualize these little proteins scurrying about and locking antigens in the protein's antibody binding site, preventing the antigens from doing any further damage to the body. I have heard about people who have had immune deficiency diseases, where the body is easily susceptible to sickness. Until reading this article I didn’t really know the nuts and bolts of how the body did – or did not – tackle sickness and disease in the form of antigens. I knew general things about having a low white blood count and things like that, but nothing about antibodies and antigens.